Fresh on the heels of Nikon's historic entry into the mirrorless full-frame market, Canon has announced its new EOS R camera, a new Rf mount with four lenses and a few adapters. The EOS R has a 30.3MP CMOS full-frame sensor powered by the same DIGIC 8 processor that was premiered with the Canon M50. The EOS R has a native ISO range of 100-40000 and maximum shutter speed of 1/8000s. Canon's renowned Dual Pixel AF is on board the EOS R and is coupled with an insane 5,655 focus points that cover the sensor 88% vertically and 100% horizontally. 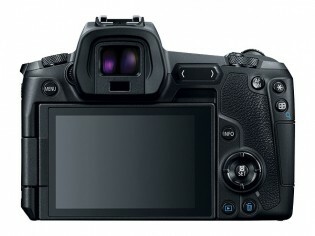 There's a 3.69M dot electronic viewfinder as well as a fully articulating 3.2-inch touchscreen LCD underneath it. Canon has given the EOS R the traditional two control dials but there's no thumbstick for quick AF selection. Instead you get a customizable touchpad on the right of the viewfinder that can be set up to control different parameters (like AF point or exposure compensation). 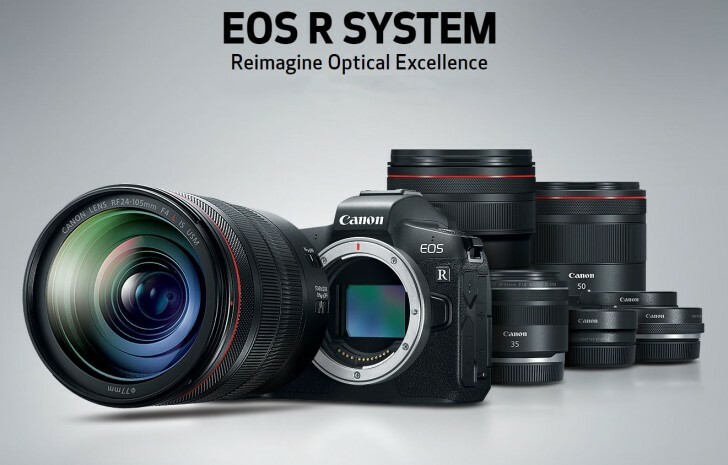 The Canon EOS R is powered by the same LP-E6N battery that powers the 5D Mark IV DSLR but in the EOS R it promises only 370 shots. 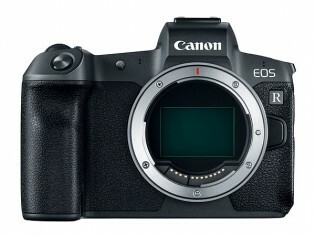 Another "downgrade" from Canon's prosumer DLSR is the lack of a second card slot, a grievance the EOS R shares with Nikon's new Z6 and Z7 mirrorless cameras. the The EOS R lacks in-body image stabilization, which actually puts it at a disadvantage compared to the Z6 and Z7 and Sony's line of A7 full-frame mirrorless cameras. Video-wise the Canon EOS R can capture 4K/30fps at up to 480Mbps bitrate and 1080p up to 60fps at 180Mpbs. There's also 120fps slow-motion capture at 720p resolution. The Canon EOS R premieres a new RF mount that shares the 54mm diameter of the company's EF mount but reduces the flange distance considerably. 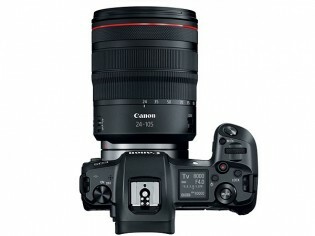 The new mount premieres with four new Canon lenses and three adapters. 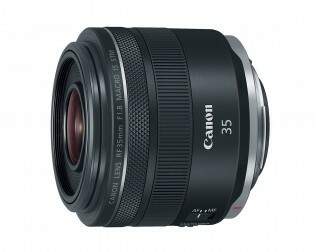 The new lenses are a premium Canon RF 28-70mm F2L USM - canon's brightest zoom lens, the new Canon RF 24-105mm F4L IS USM, a Canon RF 35mm F1.8 Macro IS STM and a Canon RF 50mm F1.2L USM. 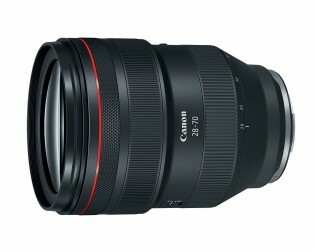 The most expensive among them - the RF 28-70mm F2L USM - will start selling for the hefty $2,999 in December. 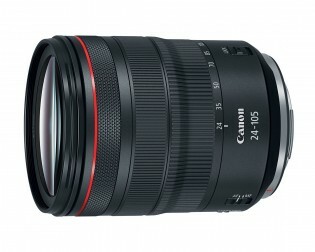 The RF 24-105mm F4L IS USM is also starting its retail run in December, priced at $1,099. 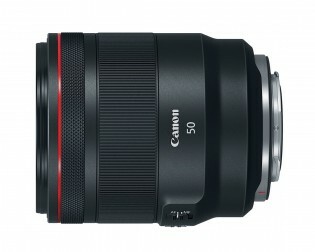 The RF 50mm F1.2L USM goes on sale next month for $2,299 while the cheapest of the four, the RF 35mm F1.8 Macro IS STM, will go on sale in December for $499. EOS R buyers will be able to adapt their existing EF and EF-S lenses through the three adapters - a standard $99 EF-EOS R, an EF-EOS R with a control ring for $199.99 and a Drop-in Filter Mount EF-EOS R for $299.99. 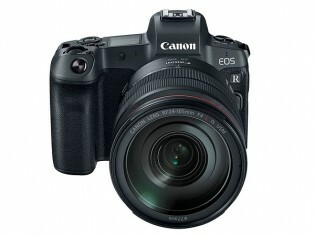 The Canon EOS R will go on sale in October for $2,299 body only or for $3,399 with a RF 24-105mm F4L IS USM kit lens.